India is home to some of the most spectacular waterfalls in the world. Each waterfall in India is amazing in one way or another. Still, some of them outranks others in the case of beauty of flow and the location they situated. Here the list of 10 most spectacular waterfalls in India. 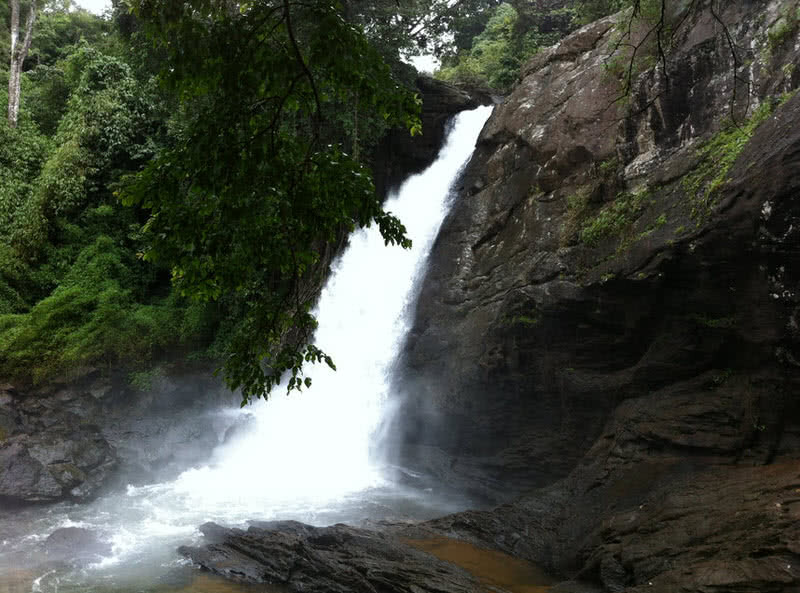 It is a 200 meters high, three-tier waterfalls located in Vellarimala mountain range in Wayanad. Soochipara falls is popularly known as ‘Sentinel rock waterfalls’. It is among the most popular waterfalls in Kerala. 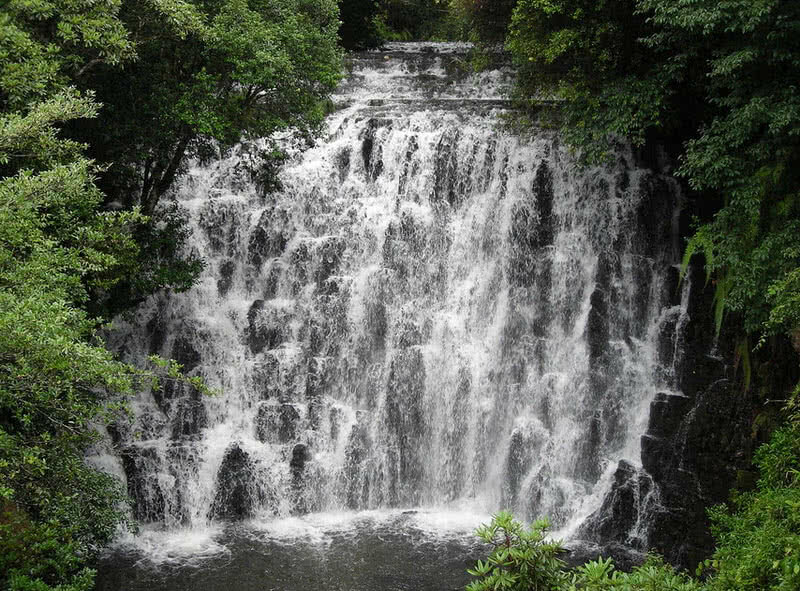 Apart from the breathtaking beauty, the Soochipara falls is surrounded by dense, evergreen forest. The Malayalam words ‘soochi’ and ‘para’ means ‘needle’ and ‘rock’ respectively. In fact, the Soochipara falls is named after the needle-shaped rock on the site. Beneath the waterfall, you can see a pool which is well suited for swimming. During monsoon season, the water flow rate becomes at its peak at the Soochipara falls. The view of this waterfalls at that time is just breathtaking. On the way to Soochipara falls, you can also enjoy some of beautiful tea estates in the Wayanad district. This site is also best for climbing, walking and wildlife watching. Fruit garden falls (Pazhathotta aruvi). Upon these nine waterfalls, only three (Main falls, Five falls and old Courtallam falls) can be reached by the road. You need to hike to reach the rest of the waterfalls in the Courtallam town. Monsoon is the best time to visit these waterfalls due to heavy water flow rate. 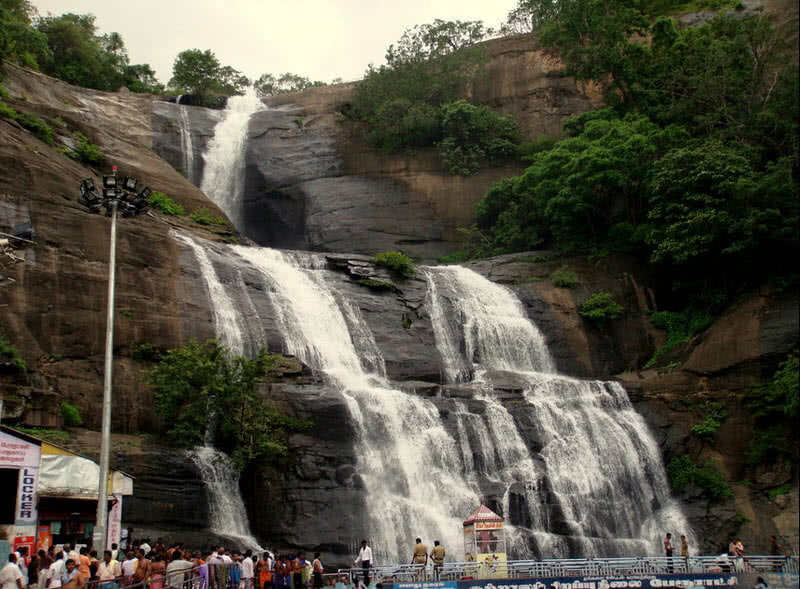 At a height of 60 meters, the Main falls of Peraruvi falls is the highest among the Courtallam falls. Courtallam falls is famed as ‘the natural spa of South India’ because the waters of these falls have medicinal properties. It is said to be the waters of Courtallam falls can cure many skin problems. There are also a number of health resorts situated near these falls. 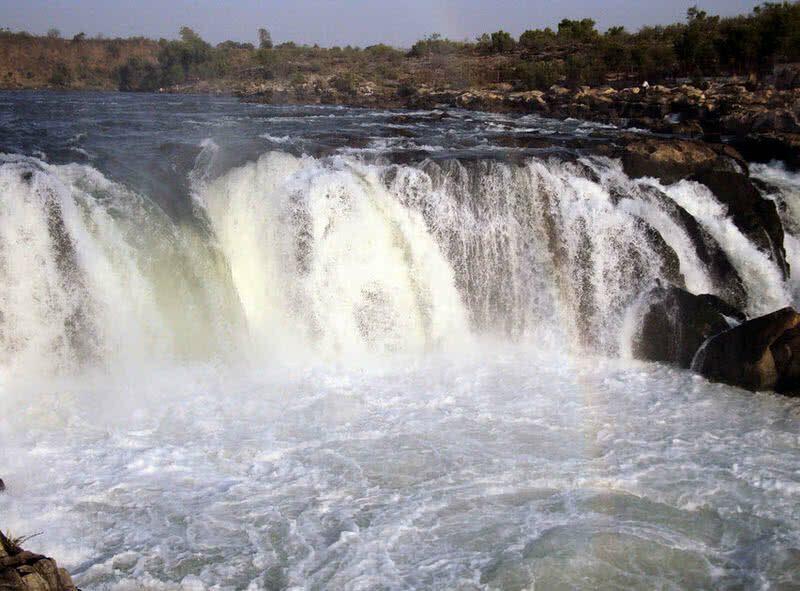 Dhuandhar falls is a picturesque waterfall on the holy Narmada river Jabalpur District of Madhya Pradesh. Dhuandhar falls is also known as ‘Smoke cascade’. Because the waters of Dhuandhar falls will create mist during their descent. It will definitely be a great treat for your eyes. The Dhuandhar falls just has a height of 30 meters. But the water flow rate in this waterfall is very high. The pool beneath the Dhuandhar falls has a depth of 350 feet. In addition to the mist effect, the surrounding marble rocks make the Dhuandhar falls worth seeing. To enjoy the real beauty of Dhuandhar falls, you should visit during the monsoon season. You can see waters rushing over the rocks at that time. Boat facilities will be available at this site in the post-monsoon season. 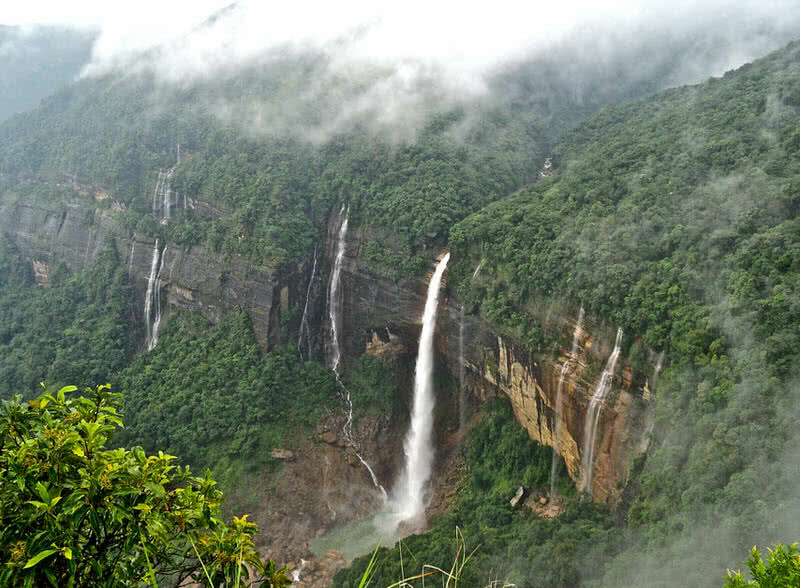 The elephant falls is one of the best places to visit in Shillong. These falls are named after the elephant-shaped rock near them. The local Kashi people called this amazing falls as ‘Ka Kshaid Lai Pateng Kohohsiew’ which means ‘three steps waterfalls’. As its name suggests, the waters rush over the stone steps which is a visual treat for the visitors. The elephant falls are divided into three phases. All these phases are small in size, but worth seeing. Both monsoon and post-monsoon seasons are best for visiting. But during monsoon you can see water flow at its full force. Kempty falls is a picturesque 40 ft high waterfall located in the Mussoorie hill station in the Dehradun district of Uttarakhand. This hill station is situated at an altitude of 4500 ft above sea level. Kempty falls are famous for their beauty and panoramic surroundings. 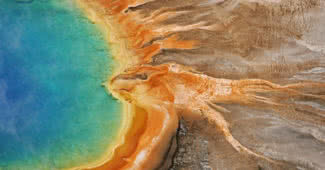 It was a British officer named John Mekinan who developed this fantastic place as a tourist destination in 1835. Kempty falls is actually one among five different falls which developed by splitting off a stream by the rocks. But no other falls are as beautiful as kempty falls. There is a natural pool at the footstep of the falls. You can take a bath in this pool while enjoying the beauty of the kempty falls. In addition to all these, the panoramic view of the surrounding places will definitely leave you breathless. Hogenakkal falls is perhaps the most beautiful waterfalls of Tamil Nadu State. This amazing series of waterfalls located on the famous Kaveri river in the Dharmapuri district of Tamil Nadu. It is a major tourist attraction in the State and immensely famed for boat rides and medicinal baths. First of all, Hogenakkal falls can’t be reached by road. You need to take a boat ride to reach the falls. To get a closer view of the Hogenakkal falls you should hire a coracle (a small, light-weight boat). But boating is only allowed in the post-monsoon season. 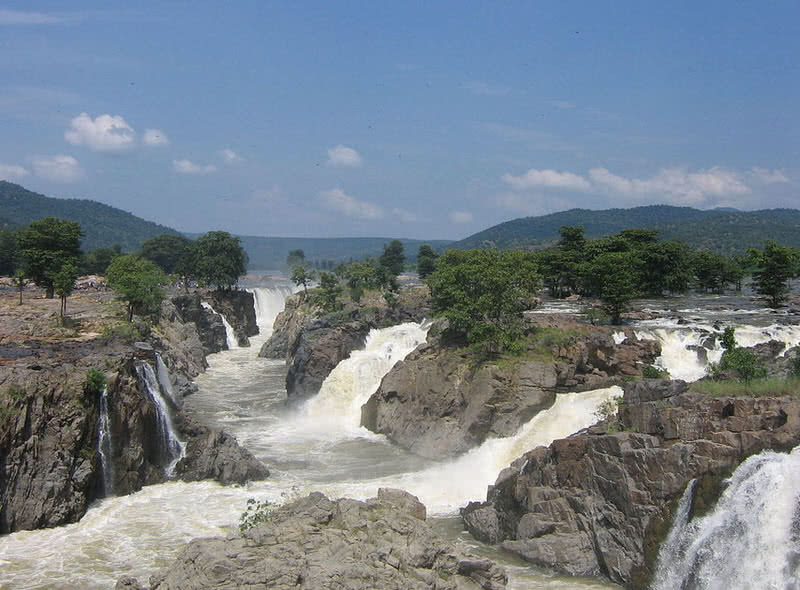 Hogenakkal falls comprises a series of falls varying in height. The highest fall at this site measure 65 feet in height and the lowest is 15 ft. You can see a mist effect at the Hogenakkal falls due to falling of water on the hard rocks. The carbonatite rocks near these falls are one of the oldest dated rocks in the world. It is better to avoid the monsoon season to visit the Hogenakkal fall, because of dangerous slipping conditions. The boating services will also shut down by that time. At 1100 ft, the Nohkalikai falls is the fourth highest waterfalls in India. This beautiful waterfall is located in the East Khasi hills of Cherrapunji town of Meghalaya State. Undoubtedly, Nohkalikai falls is the most beautiful waterfall in the Meghalaya State. The descending of water from a high cliff that surrounded by uninterrupted green forests is just breathtaking. The continuous falling of water from the great height also has created a pool at the foot of Nohkalikai falls. Throughout the winter, the waters of this pool display brilliant blue color. It will turn into green in the next summer season. Try to avoid the visit to Nohkalikai falls during the Monsoon. Because, the waterfall becomes unclear to you due to the thick cloud cover. The fall (September-October) is the best time to visit the Nohkalikai falls. Throughout the fall the sky of this site becomes clear so that you can enjoy the beauty of Nohkalikai falls at its best. The majestic jog falls is located on the sharavathi river on the Shimoga district of Karnataka. 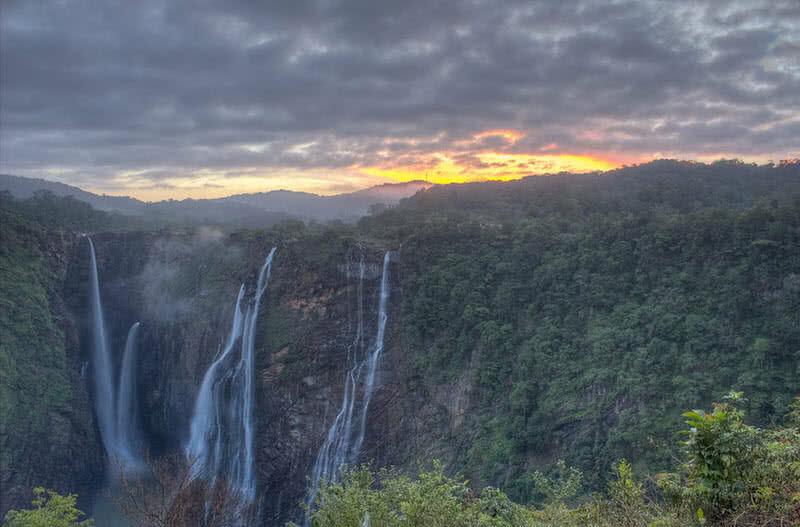 Descending from a height of 830 feet, the jog falls is the highest plunge waterfall in India. There are four different falls at the jog falls that combined to form a large, spectacular waterfall. You can reach the jog falls en route National Highway 4. It is advisable to visit the jog fall in Monsoon. You can see the rushing of waters at its full force at that time. You can’t simply take off your eyes from the view of Jog falls with the dense, green forest backdrop. You can also see beautiful displays of rainbows near Jog falls during the monsoon. But in post monsoon seasons you can only see thin streams of water at the jog falls. There are also 1500 steps built along the hillside to reach the foot of the waterfall. You can access this ladder in all seasons except the monsoon. The breathtakingly beautiful Athirappilly falls is located on the Chalakudy river in Thrissur district of Kerala. It is the largest and the most beautiful waterfall of Kerala. You can visit the Athirappilly falls anytime during the year as it never dries out. Considering the beauty, the Athirappilly falls also nicknamed as ‘The Niagara of India’. Athirappilly falls comprises four falls, fed by the Chalakudy river which originated from the Western Ghats. This 80-foot high waterfall has a width of 330 feet. The view of majestic Athirappilly falls in the scenic background of dense, green rainforest is definitely an unparalleled attraction of Kerala. The view of Athirappilly falls in the monsoon is simply stunning. You can see the gushing of water over the rocks and mist near the falls. During this season, you can even hear the thundering and see the mist en route to the Athirappilly falls. The route to the Athirappilly falls is as scenic as this waterfall – A well-maintained road through the dense, green forests, mountains, and valleys. It is definitely one of the most scenic routes in India. While you are travelling along this road, you could also enjoy a pleasant mild temperature. 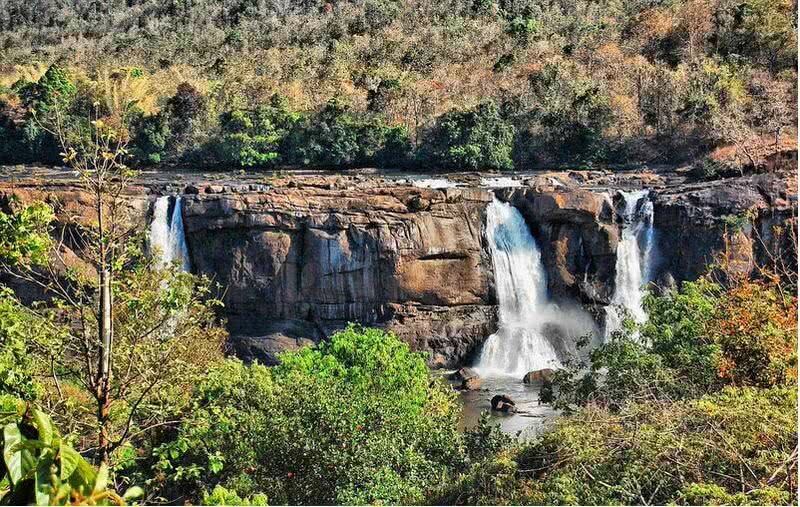 On the way, you will get the stunning long view of Athirappilly falls. In monsoon, the entire site becomes crowded. In post-monsoon season, you can reach at the foot of Athirappilly falls. It will bring an amazing view of this waterfall from a different perspective. There are two more beautiful waterfalls situated a few kilometers away from the Athirappilly falls named Charpa and Vazhachal. The Charpa falls is very near to the road. In monsoon, you can enjoy the spraying of water from this picturesque waterfall. Unlike the Athirapally fall, Vazhachal is a sloppy fall, but worth seeing. The gorgeous Dudhsagar falls in Goa is perhaps the most beautiful falls in India. The Konkani name ‘Dudhsagar’ means ‘Ocean of milk’ in English. As the name suggests, the long view of Dudhsagar falls resembles flowing of streams of milk along the mountain side. It is definitely a don’t miss attraction during your Goa visit. Dudhsagar falls is a four-tiered waterfall that originated from the high peaks of the Western Ghats. It comprises four different vertical falls. At a height of 1020 ft, Dudhsagar falls is the 6th highest waterfall in India. You should visit the Dudhsagar falls during the monsoon to enjoy the beauty of this waterfall at its best. The furious flow of Dudhsagar falls in the monsoon will definitely be a visual treat to your eyes. 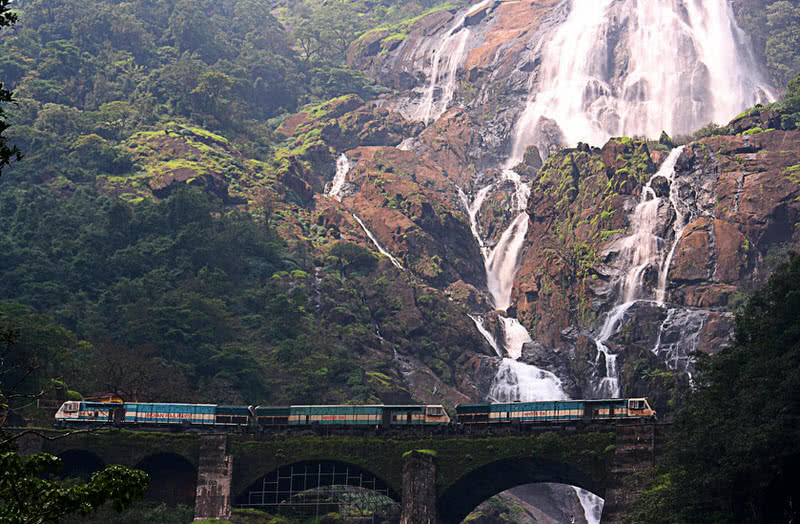 To your surprise, the South Indian railway route passes just in front the majestic Dudhsagar falls. Take a train from the Kulem railway station, near the Mollem National Park. Once it crosses the arch bridge that situated just in front of the Dudhsagar falls, you will get a breathtaking view of this spectacular waterfall. You can also hike along the railway route to reach the Dudhsagar falls. The old railway tunnel built by the British and dense, green forests are the other attractions you can enjoy near the Dudhsagar falls.